The Lydian mode is the fourth mode of the major scale. It is similar to the Ionian mode, but has a raised fourth (#4) instead of a perfect fourth. It gets interesting when it is played over a major chord, for example playing a F lydian over a FM7 brings a little bit of tension because of the raised fourth / raised eleventh (#4 - #11). What's The Lydian Mode Interval Pattern? As shown in the table below, the interval pattern for the Lydian scale is 1 (root) - 2 (second) - 3 (major third) - #4 (augmented fourth) - 5 (perfect fifth) - 6 (sixth) - 7 (seventh). How To Play The Lydian Scale On Guitar? 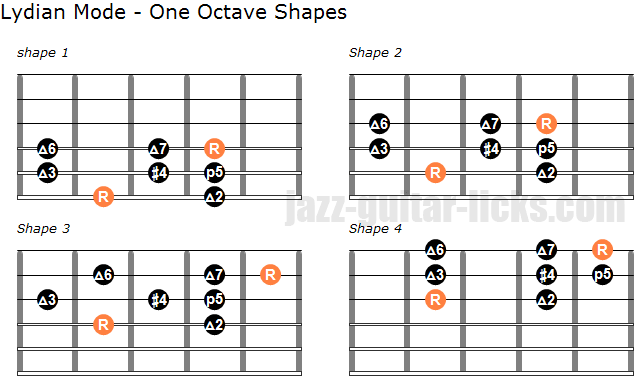 Here are four guitar shapes to play the Lydian mode. The first shape has roots on the 6th and 4th string. The second shape has roots on the 5th and 3rd string. The third shape has roots on the 4th and 2nd string. The fourth shape has roots on the 3rd and 1st string. To understand and "hear" the lydian mode it is recommended to play these patterns starting with the "root". What is The Root Note? Every scale has what is named "the root note". This is the most important note of a scale, it gives its name to the scale. For example the root of the F Lydian scale is "F", nothing's easier. In the diagrams this is the orange note (R). To play the F Lydian mode using the first shape, starting with the lowest root, you have to put your second finger on the sixth string at the first fret (or the thirteenth fret). To play the F Lydian mode using the second pattern still starting with the root, you must put your second finger on the fifth string at the eighth fret. These two shapes show how you can play the Lydian mode in position whithin the space of two octaves. Once you have learned all these shapes be sure to play them in twelve keys by moving the root to the desired note keeping the same intervals. The Lydian mode harmonized in thirds gives the following chords and arpeggios. 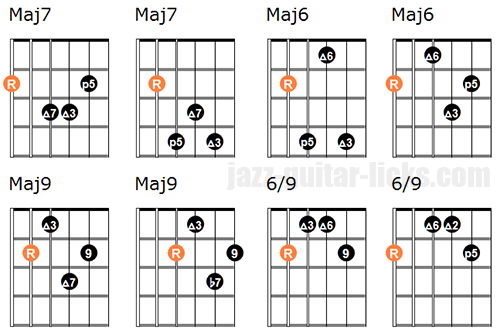 The Lydian scale can be applied to a number of chord types, the most obvious are : maj6#11, maj7#11 and maj9#11. However, you can use the Lydian mode over over non-altered chords as maj7, maj6, maj9, simply to add tension to your lines. Look at the diagrams below and try to associate them with the Lydian shapes previously seen. 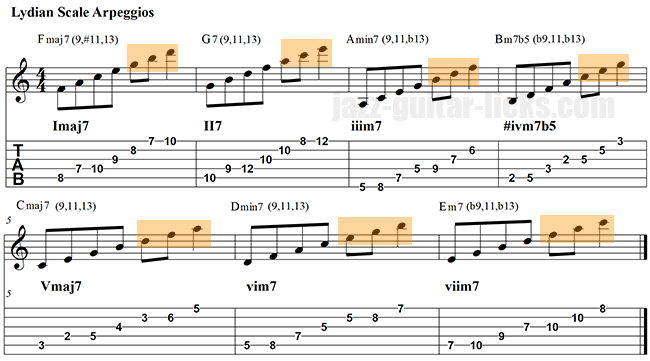 When playing a minor pentatonic scale (1 - b3 - 4 - 5 - b7) starting from the major seventh (7) of a maj7#11 chord you emphasize the important chord tones that are the seventh (7) and the third (3) as well as the upper-structure (9, #11 and 13). Over an Fmaj7#11 chord, just take the seventh degree (E) and play a minor pentatonic scale (E - G - A - B - D) as shown in the first phrase below. Here is Fmaj#11 line. You see an E minor pentatonic scale on the first two bars. This F Lydian lick contains thee intervals of sixths ; C - A ; B - G and A - F. Trying to play intervals from the Lydian mode can bring interesting ideas into your major lines. Another idea of Lydian lick is to add a chromatic passing tone, a flatted fifth, between the fourth and the fifth of the minor pentatonic scale, thus giving an E minor blues scale. 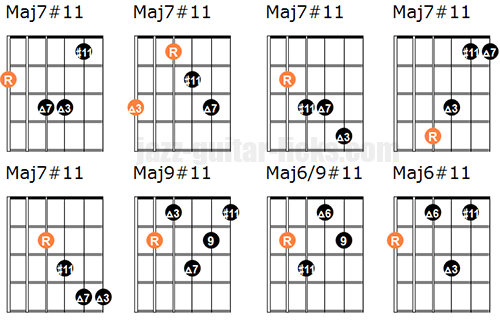 This way you will set a short chromatic line (A-Bb-B) to approach the #11 of Fmaj7.